This isn’t the case for the light vehicles that you and I drive. While most of us will repair something that needs it promptly, we seldom perform a cursory walk around check much less a more careful inspection. Few people realize that if their vehicle is no longer equipped in compliance with the Motor Vehicle Act and Regulations, they are required to remove their vehicle from the highway forthwith and repair it. Mandatory annual inspections are not required for either mechanical defects or exhaust emissions today. As an aside, many countries require proof of passing a safety check before they will renew the vehicle’s licence each year. Here in British Columbia, insuring mechanical safety is left to the owner, and if they fail in their duty, the police. In my experience as a collision investigator, I could not point to many incidents where a vehicle defect was the direct cause of a collision. Having said that, I’ve often wondered if deferred maintenance prevented the driver from overcoming a driving error that resulted in a crash. The tool used by police to enforce vehicle maintenance is the Notice & Order. For minor defects such as a burned out tail light, Box 3 is checked. It requires that the vehicle be repaired promptly and within a certain number of days be presented at the place designated by the officer to show that repairs have been carried out. This is usually the nearest police station. If the defects are more significant, Box 2 is checked. This requires that the vehicle be inspected at a designated inspection station promptly and repairs confirmed by a passed inspection within 30 days. Ignoring the order will result in denial of licence transactions by ICBC and a ticket and tow if found by police being driven on a highway. For the most serious defects, Box 1 is checked. The officer will also call a tow truck to take you home and very likely will also order you to surrender the vehicle licence and number plates. These will be returned to ICBC and it will be up to the owner to pass inspection and deal with ICBC to obtain a new licence and number plates. The vehicle must not be driven or parked on a highway until a pass is obtained for it from a designated inspection facility. 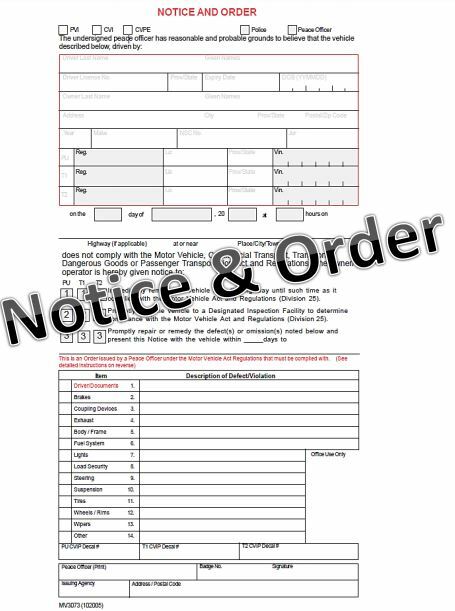 The officer could choose to issue the driver with a traffic ticket for the defects in addition to the Notice & Order. Failing to follow the requirements of any of these orders could result in a $598 violation ticket being issued, even in the case of a Box 3.